I have a question about the 3D camera setup. I want to put the camera behind the scene and look at 0, 0, 0. Now the camera is behind the scene like I wanted, but the view is horizontally rotated about 90 degrees. Now the camera is not rotated and it looks all right, but now the x axis is flipped (-x). 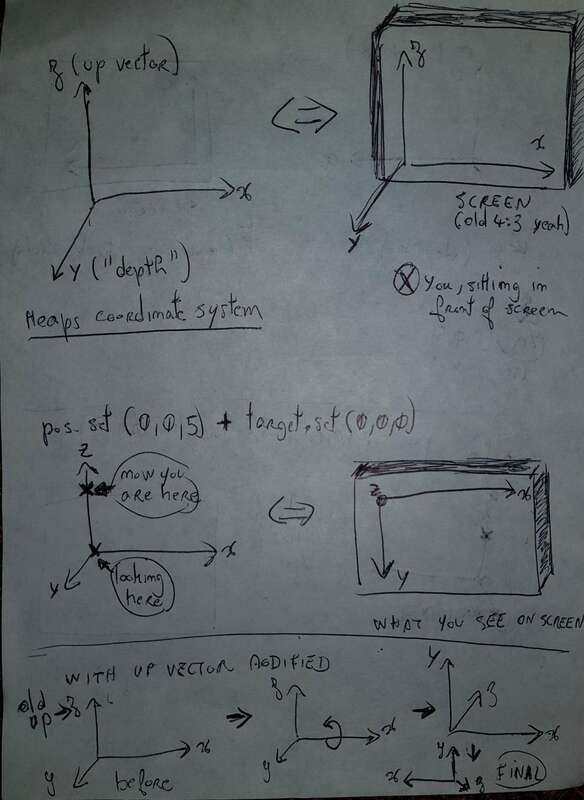 When I move a box with x += 0.01, then the box moves to the left instead to the right. How should I set up the camera to look from behind (-z) to front without rotation and without flipping the x axis? Héhé, i’ve asked myself the same question and did the same as you. My conclusion: don’t mess with the up vector, and use the heaps coordinate system. So you are telling me that Z is not front to back (depth) but it is up and down? That’s because all the 3D tools I’m using and the most 3D Engines have a X => horizontally, Y => vertically, Z => depth coordinate system. That explains everything. Thank you very much. Thank you for explaining me and for the nice drawing. Yes, Z is up vector. Blender also uses Z as up vector. I suspect 3D Studio is doing the same, and heaps has probably adopt the standard of its default tool. Even when you know that there are no standard for depth in coordinates systems, it’s a bit disturbing.